Think before you tweet, folks. Think before you tweet. According to his Twitter profile, Jeff Barnd is a "FOX 45 News Anchor #Baltimore Loves current events, politics and has an aversion to twitchy bug parts when you step on them." At the time of this writing, Barnd's tweet is still live, but he'll probably want to take it down soon. The Baltimore Ravens and Houston Texans, of course, both play in the American Football Conference (AFC). That means there's no way they would ever face off in the Super Bowl. The NFC champion and AFC champion from each conference duke it out in the Super Bowl each year. View some of the best Twitter response to Barnd's tweet after the jump. @JeffBarnd How are 2 AFC teams gonna play in the Super Bowl? Baltimore--stupid is as stupid does -->RT @JeffBarnd Two weeks from tonight... The season opener! 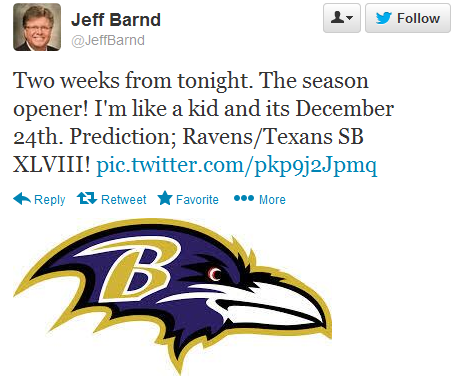 Prediction; Ravens/Texans SB XLVIII! @JonHeathNFL @JeffBarnd Gets his information from Skip Bayless. Uh.. yeah. LOL! RT @Skotty_Payne: Hahahaha RT @JeffBarnd Two weeks from tonight. The season opener!. Prediction; Ravens/Texans SB XLVIII! Try again RT @JeffBarnd 2 weeks from tonight. The season opener! I'm like a kid and its December 24th. Prediction; Ravens/Texans SB XLVIII! put your palm on your face RT @JeffBarnd: Two weeks from tonight. The season opener. Prediction; Ravens/Texans SB XLVIII! JHSM can confirm that neither the Ravens nor the Texans have changed conferences. Barnd's twitter feed is in for a long night.